Year, after year, Whistler-Blackcomb gets voted a top ski resort: sometimes it's for Best Terrain, or Best Resort Overall... As one voter once told Ski Magazine: "If you can't have a great vacation at Whistler - find another sport!" Read below about Whistler's mile of vert, huge skiable rain, and an extra-long ski season. Though known as a trendy spot with great apres-ski, Whistler has plenty for families: kids programs, adventure zones, play-fort, magic-carpets, and more. Whistler is a popular and very-developed area, and was a major venue in the 2010 Olympics. Whistler Village -- at the foot of gondolas that serve both mountains-- has shops, restaurants, and hotels; adjacent streets have numerous condos, townhomes, etc. The Whistler-Blackcomb mountains have over two hundred trails, over 8000 acres of terrain, nearly a mile of vertical drop, thirty-eight lifts and gondolas. Whistler's base elevation is only 675 metres/2,214 feet, which means that visitors can enjoy its mile of vertical rise without worrying about altitude sickness. This showpiece gondola stretches 2.73 miles with only two towers on each mountain -- which makes a spectacular ride, year-round. The ride takes 11 minutes. Whistler is one of a handful of ski resorts that stay open into May. 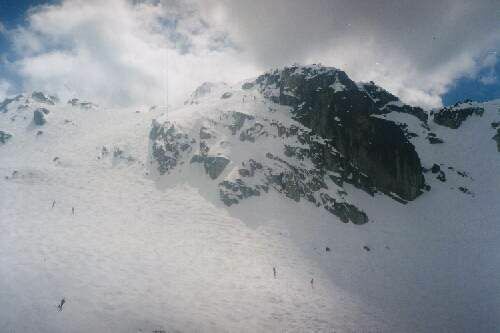 Blackcomb Mountain stays open later than Whistler, as late as May 20th, weather permitting. Whistler, meanwhile, closes in late April to prepare for mountain biking. May is a beautiful time to drive the Sea to Sky Highway for great late-season skiing, and visitors get an extra hour on the lifts each day and uncrowded slopes. At this late date, you're skiing basically on only the top portion of the mountain; the bottom areas have no snow and you may even see bear on the ground as you ride the lift up! Another plus is the springtime weather in the Village and al fresco dinner after your day on the slopes. Whistler has its glorious days, but this is not the land of "champagne powder" ( - those divine words used in Utah, Colorado, or the interior of BC.) Snow can be wet; rainy days happen, on the lower slopes. On the plus side are: moderate temperatures, and a whopping average snowfall of 30 feet per year. People flock to Whistler in summer, too, for mountain biking and for scenic hiking; lift tickets include the Peak2Peak gondola between the two mountains. Hiking trails are well-marked and have interpretive signs about plants and animals. Also highly popular is the Family Adventure Zone at the foot of Blackcomb mountain has "Kiss the Sky" trampoline (part bungy, part trampoline), climbing wall, "Westcoaster Luge", minigolf, and more. Kids programs: Whistler Kids is one of the largest kid ski/board programs anywhere, with centers on both Blackcomb and Whistler mountains. "Magic Carpets" make learning easy for little beginners. At the popular Adventure Camps, kids stay with the same group and instructor all week long. Babies and toddlers: Whistler Blackcomb has licensed childcare, and parents get a pager. Teens have a week-long "Ride Tribe"; other programs too, such as special night-time jib sessions. Terrain Garden: of course the two mountains have challenging parks and pipes; meanwhile this kinder, gentler terrain park is great for kids. Adventure and Play Zones: Blackcomb Mountain has a Children's Adventure Park, with runs through an enchanted forest, even a ski-through castle. Whistler has an Adventure zone and a play-fort. Enclosed gondolas - on Whistler mid-mountain, families can ski downhill on green runs, and ride back up in the shelter of a gondola. Family Zones: these green-run areas on Whistler have signage for "Family Zones" and "Go Slow". Coca Cola Tube Park has eight lanes, graded green to black. Many condo-style vacation home rentals offer roomy premises and all the comforts of home. In areas near Whistler Village, free shuttle buses run frequently to Whistler and Blackcomb gondolas during ski season. Another popular zone is Whistler Creekside: five minutes drive from the Village, and with its own gondola, and grocery store and other amenities. Many guests stay in hotels in Whistler Village. The extensive car-free Village begins at the foot of the Whistler and Blackcomb gondolas, and --with over 300 shops and restaurants-- has plenty to offer party-ers, gourmet diners, and families. Meanwhile, the Upper Village -- near the Blackcomb ski lift -- has the Four Seasons Whistler and the Fairmont Chateau Whistler luxury properties. Even the posh properties welcome families, and many hotel rooms have kitchenettes. A well-stocked grocery store is in Whistler Village, as are the conveniences of restaurants, MacDonald's, Starbucks, ski shops for whatever gear you forgot to bring, etc. For eateries, our family likes the Old Spaghetti Factory, with fun decor and 3-course kids' meal including drinks-- with refills!-- for a very modest price; but you can find kids' menus at many restaurants, even upscale spots. Tourism Whistler will help you find lodgings; also numerous booking sites offer vacation homes online. There's no night-skiing at Whistler ski resort. But the Tube Park and Magic Chair lift are open and some special teen programs are offered at night. Whistler has numerous restaurants on the slopes, including fine dining (outdoors, in spring-time) and smaller cabin-like spots with great specialties -- such as the famous Belgian Waffles at the Crystal Hut. Whister ski resort is dog-friendly! Many hotels welcome Fido. As is common in the travel industry, the writer was provided with complimentary accommodation for the purpose of review. While it has not influenced this review, About.com believes in full disclosure of all potential conflicts of interest. For more information, see our ethics policy.